You will find the Fusion Forms Tools on their own toolbar. If you do not see the tool bar you can display it by selecting the menu item View then putting a check in front of the Form Tools list item. You can select the Form Area tool from the Form Toolbar and drawing a rectangle to hold your form. 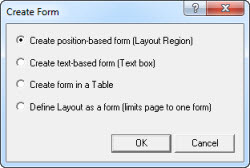 The Create Form dialog box will open to ask you what type of form you want. You can draw your own layout region, text box, or table using those tools, then put a check in the box on the selected object properties palette to set that object as a form. There is also an option to select the entire layout as the form on the layout properties palette. This is basically the same as using the Form Area tool but it is a manual process. This second method is good if you already have an area on your page that you want to make a form. What ever method you choose to hold your form is fine. Use the tools from the Form Toolbar to select and place the form elements you want to use. Just select the form element from the toolbar and draw a rectangle where you want that form element to be shown. The Form Toolbar has the following form elements you can use. Multi-Line: This is a multiple line input box, as the input grows a scroll bar appears. Field Label: Select this tool to place text you wish to be associated with a form field. The label will be part of the form processing and next to the form contents in the email that is sent. In the case of radio buttons you can select several buttons to associate with one label. Select the Form Label Inspector tab , then select the form element from the drop-down box to associate with the form label.